Tablet HS 643 in Jena. When I was visiting the tablet collection in Jena (as one does) my mind naturally turned to fact-checking GURPS books. Back in 2007, some of the thoughtful writers at Steve Jackson Games put together an article “How Heavy is Dense Reading?” on the density of information from medieval manuscripts to modern printed books in words per square metre, words per kg, and words per cartload. They included some guesses about Greek papyri and cuneiform tablets, but did not seem to have as much data for those. Their house style discourages mentioning sources, but I am pretty sure that their medieval data comes from a survey of all surviving medieval European manuscripts which a professor mentioned in my undergraduate days. Today, I would like to put together some evidence on the size and capacity of small cuneiform tablets to help them fill in the gaps. 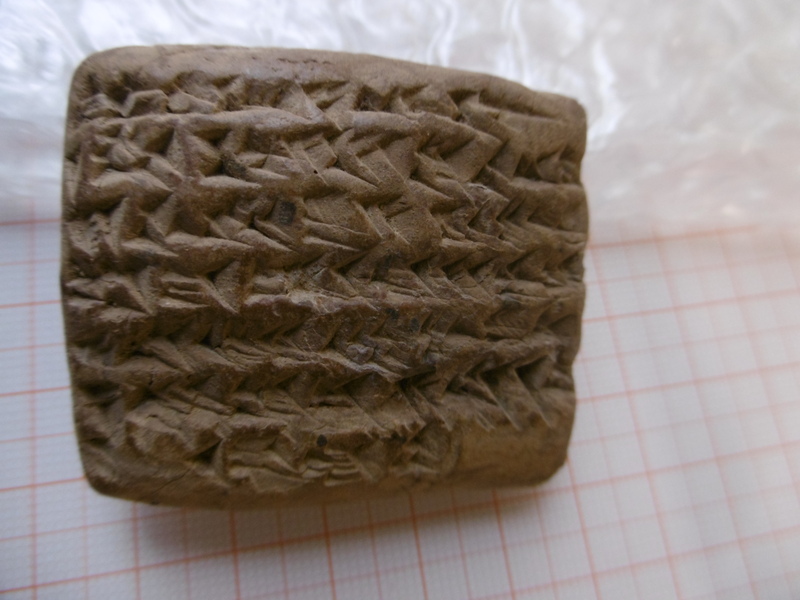 Cuneiform texts were written on lumps of clay with a wide variety of sizes and shapes, from ‘nails’ or ‘cones’ suitable for staking a vampire, to round lens-shaped tablets which fit on your outstretched fingers. The largest tablets, used for ‘literary’ and ‘scholarly’ texts like omen-lists and stories about Gilgamesh, could approach the size of ordinary A4 or US letter paper with several columns of writing. These two tablets are brief records in the handwriting of the Neo-Babylonian and Achaemenid periods; one is dated by an illegible King of Babylon, King of the Lands. Text: 17 lines on recto, verso, and one edge, of which the first two are “mār banê ša ina pāni-šunu / Ah-šunu mār-šu ša Kidin-Marduk” (13 words if we count the pronominal suffixes) so about 110 words. I can’t read every line, nor believe the transcriptions I have seen, so can’t count the whole text. Density: I have not weighed any tablets, but 2 g/cm3 is at the high end of estimates of the density of fired bricks or adobe. Mass (estimate): Given above assumptions about volume and density, about 42 g.
Text: 19 words on recto, 5 words on edges, no words on verso. For comparison, manuscripts in “How Heavy is Dense Reading?” tend to contain 2k to 4k words per square meter, and 8k to 25k words per kg. These tablets have five to ten times as many words in the same area, and eight times fewer words per kilogram. They get part of this extra density by using the whole surface (unlike the half-empty medieval page) and partially by using a cramped form of a logographic script. Someone who wanted dimensions for large tablets could check out A.R. George’s edition of the epic of Gilgamesh, which has sketches of the principle tablets with a scale attached, or photos with measurements in the caption, and is available for free as a PDF. Almost all of these big tablets are broken, but the sketches and descriptions give enough information to estimate the original size. The original impetus for “How Heavy is Dense Reading?” was a question about spellbooks. Like the mysterious authors of the article, I have to report that I can’t help answer that question. Someone could count words in historical ritual and magical texts, but as the authors say “their brevity may be explained by the fact that they don’t work.” Still, if someone wants to know how heavy is really dense reading, I hope that this post helps them find an answer. Further Reading: Your local university reference librarian can help you find that survey of medieval manuscripts, and similar books on Greek papyri and handwriting. Steve Jackson Games no longer sells the previous version of Pyramid magazine, so I can’t give a link to a place to buy it. “How Heavy is Dense Reading?” is file 2007/0615.6.html in the un-sorted archive which they provided to subscribers when that version was closed down. Quite a few fantasy settings seem to have paper and simple printing, to judge by the whole cases of books unprotected in various places. In the original article they talk about the difference between things like a portable Book of Hours or set of waxed tablets, and a gigantic illuminated songbook which three people in the cathedral choir would sing from together, and what kinds of historical books might be more like an adventurer’s spellbook. Its really too bad that those Omniscient Eye columns are only available to people who were subscribing when they shut down that version of Pyramid, because they had some good research (even if there was no way to follow up on it because they don’t allow citations). So this is the first time I’ve seen you respond I think – you wouldn’t just so happen to be Sean Manning of bronze-age writing fame, would you? I am and I link here from there. The Internet can be a small place at times. Although there are the parallel internets in different languages, all the groups etc. on Facebook which search engines can’t see, all the people on Tumblr creating and sharing images, … subcultures are fractal. Indeed, though as late it feels like Reddit and (increasingly) Facebook have become black holes for everything. Epic of Gilgamesh table 11 is more dense, it’s 15.24×13.33 cm (=0.02 m2), containing 2100 words on 2 sides (according to this translation: http://www.piney.com/Gil11.html which isn’t as worldy as another =2800 words). That’s 50k words/m2. I wonder how did they read these tablets w/o glasses. It helps a little bit that with a physical tablet, you can turn it in your hand to catch the light … but I find HS 643 with its ‘smushed together’ wedges and signs hard to read. A video contains a lot of information, if you measure it as gigabits, but it is interesting to compare the handful of pages of text in the printed transcript of an hour long “news” show with the bit count of the corresponding video recording. Back in the 1960s there was not a lot of talk about nanotechnology as we know it today, but there was a fair amount of reference to storing information on microfilm. Feynman’s “There’s Plenty of Room at the Bottom” talk may have been an inspiration for both. Feynman offered a $1,000 prize for scaling text down to the point where the an encyclopedia would fit on the head of a pin.